Chess for children and kids. The Burnaby Junior Chess club is pleased to announce that students from Burnaby, Richmond, Vancouver, Coquitlam, Port Moody, Langley, White Rock and Surrey attend our chess club. Our chess club for children and beginners is for kids from Kindergarten to Grade 12. 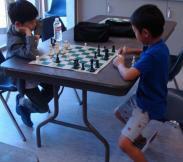 The Burnaby Chess Club is committed to the study and knowledge of the game of chess for children. Chess for children will, no doubt, improve their academic and social skills - see other benefits of chess. *New Spring 2019 Chess Classes at Bonsor Recreation Complex added! 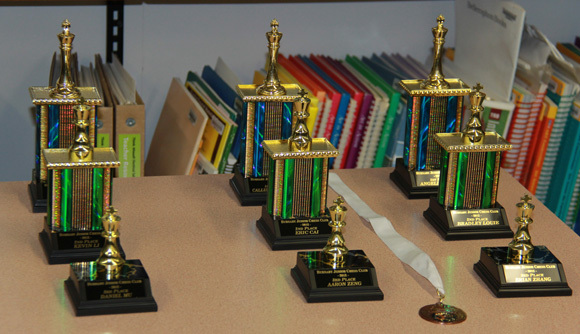 Photos of the Trophies and Medals that were presented to our students. 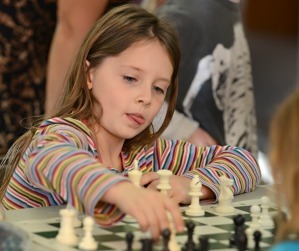 The Burnaby Junior chess Club promotes chess through various activities including, but not limited to, casual and tournament play within the club, playing bughouse, online puzzles, chess videos, hands on teaching, lectures, special guest appearances, simultaneous exhibitions and trips to chess competitions. Challenge: Black is in White's territory. Tell me how Black can finish the game off with the right combination of pieces? Hint: Checkmate in 2 using your Queen and Knight! Your Challenge: White is down by material - specifically white is down by a Rook. The question is - can White change the tempo of the game significantly by playing the right combination of moves? Can you see it?